LOOKING FOR A UNIQUE FLOOR PLAN - THIS IS IT! THIS CONDO HAS 1056 SQ. FT. A SCREENED PORCH OVER LOOKING A WOODED AREA-YET FOR YOUR CONVENIENCE IT SITS UNIQUELY ACROSS FROM THE POOL, TENNIS COURT & CLUB HOUSE. YOU'LL LOVE THE LOFT AREA WITH USES GALORE - MAYBE A READING OR TV ROOM, OR BETTER YET UTILIZE THE SPACE AS A 2ND BEDROOM WITH CLOSET- PERFECT FOR THE KIDS, OR WEEKEND GUESTS. 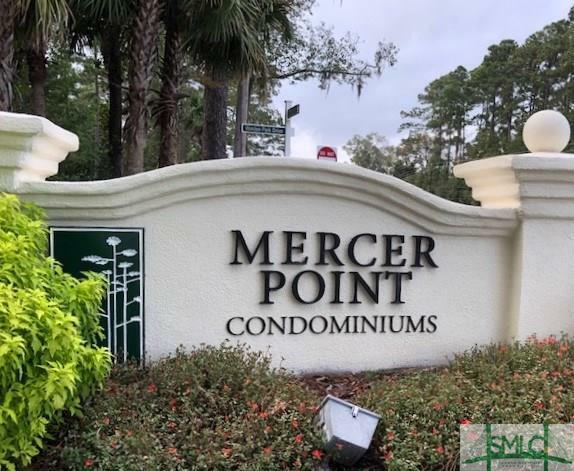 MERCER POINT IS A GATED COMMUNITY LOCATED NEAR SHOPPING, HISTORIC SAVANNAH AND TYBEE ISLAND BEACH. LOTS OF THINGS TO DO IN THE COMMUNITY OR DRIVE OUT THE GATE FOR DINNER AT ONE OF THE ISLANDS GREAT RESTURANTS.